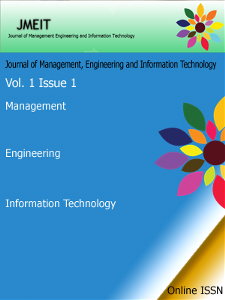 JMEIT is a multidisciplinary journal which covers Management Engineering and Information areas of research. Various areas have been mentioned in call for papers but that is not the final limit. Researchers are welcome to submit their work for the next issue. We would like to inform all ther authors who have submitted their manuscript for this issue of JMEIT we have selected the best out of them, for the rest of the manuscripts kindly improve them as per the reviewer's comments and send us again for the forthcoming issue of JMEIT. 3. Analytical View on Pradhan Mantri Jeevan Jyoti Bima Yojana- Vipin Sharma, Prof. Dr. O.P. Sarathe .